So, I’ve grown dreadfully disenchanted with A. domestica… a.k.a… the “common house cricket.” they are, unfortunately, the “par excellence” of feeder insects because of their inexpensive upkeep and prolific breeding. they are also, unfortunately, highly over mass-produced, and are often the only feeder insect available to most of the population. what led me in the direction of Blattaria in the first place was that creeping feeling after being sold a crap-load of half-dead crickets that “there had to be a better alternative… other than what i’m being force-fed to force-feed my tree frogs by the super-pet-centers, etc.” i’m sure that if you’re still reading this, you feel the same way i do about your animals, and the mass-produced, semi-nutritional, half-dead crickets just won’t do (it’s akin to feeding your children McDonalds everyday because it happens to be readily available, fairly inexpensive, and what’s flashing in your face all day via advertising anyway. ) I could utilize this space for ranting about how wretched the little, filthy, bastards are, or how much they stink, how noisy they can be as adults, and how fragile they are as far as mortality goes…… not to mention the fact that ( for some reason unknown to me ) crickets ( mind you, not other Orthopterans… no grasshopper aversion here… ) come closer than any other Hexapod ever has to “grossing me out.” I’m not scared of crickets, damn you!! Really… sorry…. let’s move on now. Based on the research I’ve done, as well as a growing enthusiasm within the hobby for this particular specimen, I’ve decided to opt for Blaptica dubia as opposed to any other readily available species of Blattaria. In spite of the fact that there are other Blattaria which breed faster than B. dubia, the overall quality of the species in all areas of consideration for my project overrides any desire to go with any other potentially available specimen. As its common name would suggest, this is a South American specimen which under natural parameters spends its life as a nocturnal, terrestrial, detrovore amongst the leaf-litter on the forest floor. 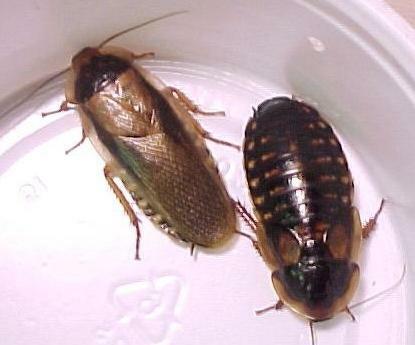 As well as being a medium-fast breeder relative to other large tropical cockroaches, B. dubia is also oviviparous, meaning that like you and I, B. dubia gives birth to live young…. typically around thirty a brood. This (again, as opposed to breeding captive crickets ) eliminates the need to use a substrate for depositing eggs. The species is sexually dimorphic, the adult males having fully developed wings ( though flightless, ) whereas the adult females posses only vestigial wing buds. Optimal breeding temperatures appear to be between 85*F – 95*F. ( as far as the entire set-up, I usually provide a temperature gradient of between room temperature and 96-97*F ) The gestation period ( I think ) is close to 30 days, with instars / nymphs taking approximately 3 – 5 months to become sexually mature. The adults typically live anywhere between one and a half to two years in age, with the males living significantly shorter lives than the females. So, one could deduce that under optimal environmental conditions, one healthy adult Blaptica dubia female could potentially produce 24 broods of 30 roaches over a lifetime… giving her a net yield of some 720 roaches over the course of her life to the collective colony. Not bad at all. 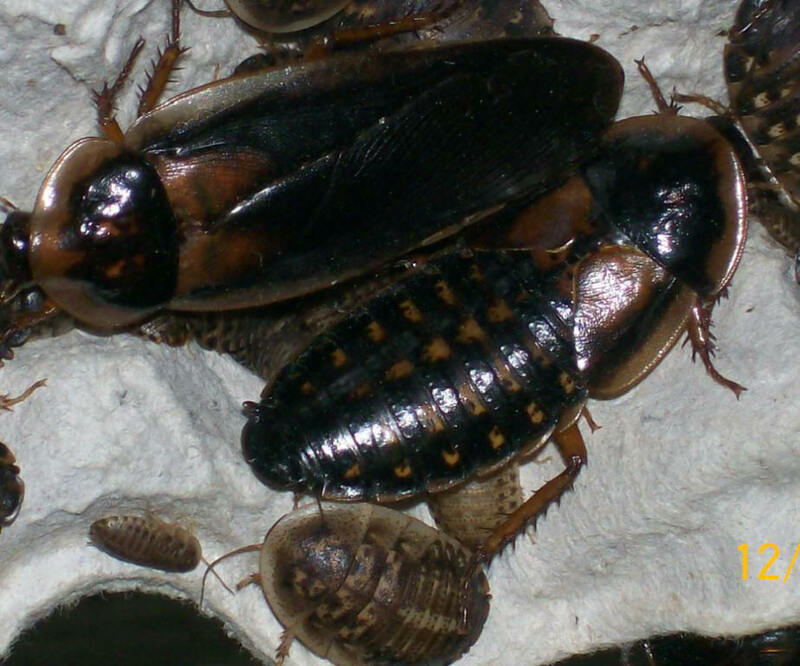 Compared to other similarly kept species such as Blaberus discoidales ( Discoid Roaches ) or Eublaberus prosticus ( Orange-Headed Roaches, ) B. dubia has a softer exoskeleton, making it more desirable as a feeder. The trade-off, however, is that Blaptica dubia is not quite as ‘meaty’ ( I prefer to use the term “big boned” especially within earshot of the roaches, of course..) as the aforementioned. This, in my opinion, is a very minor and almost insignificant factor in light of the numerous traits which make the species desirable as a feeder. another phenotypical trait conducive to breeding the species in captivity is that they are literally horrible climbers ( that is, compared to other roaches, mind you.) They cannot climb up smooth plastics or glass, which of course, makes them that much more ‘acclimated’ for captive breeding, as this ( under the correct conditions ) limits the potential for escape to almost zero. There’s typically ( under optimal husbandry, that is ) also zero odor associated with the colony. A. domestica, on the other hand, pretty much just stinks…. to put it mildly. For the most part, the B. dubia colony is very low maintenance – also a huge incentive to go with this species. In spite of being moderate in size, they’ve a high mass, or ‘meat’ to shell ratio. The list of perks seems to go on and on with these guys. all things considered, B. dubia is an ideal feeder insect, or an ideal pet. Under nominal conditions Blaptica dubia is a prolific breeder, and an all around low maintenance as well as enjoyable species to breed in captivity. Blaptica dubia may well be ( again, all things considered ) one of the best possible feeder insects available – bar none. It’s moderate size, slower speed, and soft body compared to most other arthropods make it especially suitable as a feeder. Add in the lack of flight, the lacking of a substantial ability to climb smooth surfaces, and a docile nature, and the optimum choice for a feeder becomes blatantly obvious. Geographic range: northern South America… Brazil, Guyana, French Guyana, Etc. Food & Hydration: omnivorous, therefore a diet supplemented high in protein is a must because of potential canabalilsm within the Blaptica dubia colony. Fresh, ORGANIC, fruits and vegetables which HAVE NOT been subjected to pesticides, herbicides, etc., etc., etc. there’s not only the risk of killing off the colony, but let me remember why i’m going through all this in the first place: to provide a safe, nutritious, pesticide / poison free, parasite / pathogen free natural, replenishing food source for my Hylids ( tree frogs.) I would recommend a mixture of whole grain oats ( pulverize with mortar and pestel ) and high quality / high protein fish flakes… supplemented at least three times a week with various organic fruits and vegetables. Stay away from foods high in oxylic acid ( as was first pointed out to me by a very experienced and highly reputable Hylid breeder… ) based on the following research i’ve done it appears that this substance binds with vital nutrients inside the frog’s body such as Ca (calcium) and Fe (iron,) preventing uptake, and instead depositing the metals / minerals, etc. in he liver and kidneys… …thus, bypassing any potential benefits, and potentially causing serious injury. perhaps even being a caustic agent of Metabolic Bone Desease in young, quickly growing frogs needing a good deal of Ca. Quickly, some foods rich in oxylic acid: rhubarb, buckwheat, sorrel, star fruit, black pepper, parsley, poppy seed, amaranth, spinach, chard, beets, cocoa, chocolate, most nuts, most berries, and beans. If you’re using B. dubia as a feeder, just remember that what you feed your roaches is what you feed your frogs, lizards, inverts, etc. as far as hydration goes most water uptake is accomplished via feeding fruits and vegetables which have a heavy volume of water. Although this species seems to handle the lack of moisture better than many, it is essential (especially for molting, breeding, as well as juvenile development ) to have an adequate amount of liquid available. I also use water bytes / water crystals which are jelly-like and absorb huge amounts of water for their size, as well as mist the enclosure once every other day. Other possible alternatives are using a sponge or cotton balls to hold the water ( you typically don’t want to use open water as nymphs and sometimes adults will drown. ) another consideration when using a sponge or cotton balls is the fact that they make perfect little petri dishes for bacteria to grow inside of…. I would not recommend the latter method, as it excludes possible negative factors. Be sure that you’re using dechlorinated water! If you must use tap then there are water conditioners available to deactivate the chloramines and chlorines, and if that is not a possibility then you can leave the water – uncovered – for 48 -72 hrs. to allow said chemicals to evaporate. I prefer the conditioner when using water from the tap for the peace of mind. Life cycle: after copulation, and an accompanying 30 days of gestation, females give live birth to around 30 or so nymphs. Metamorphosis is simple, and it takes between 3- 5 months until maturity is reached. Adults live between 1.5 to 2 years, with the females outliving the males considerably. Description: adults 1.5” – 2” (inches). Adult males have a full set of wings, however are flightless, while adult females have only vestigial wing buds. The pronotum covers almost all of the head, and they have flat, oval bodies, with long, slender antennae. Nymphs are typically mottled grey/brown and orange, however more drab than adults. 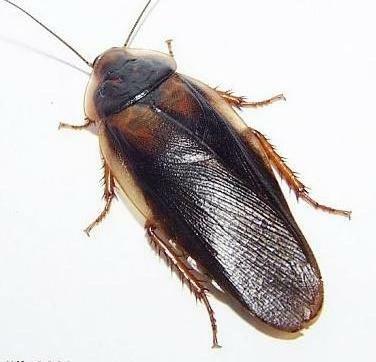 The adult females may be splendid in their coloration, giving he roach it’s common name. Females may have brilliant orange spots set on a dark black background which can be very beautiful. Housing / Captivity: this species is a piece of cake. No substrate, and you’re typical Rubbermaid set-up with stacked vertical egg-crates, ventilation, and heating elements. (will describe in detail later. ) an ideal temperature range is 75*F – 95*F. Make sure to use an opaque / dark enclosure. 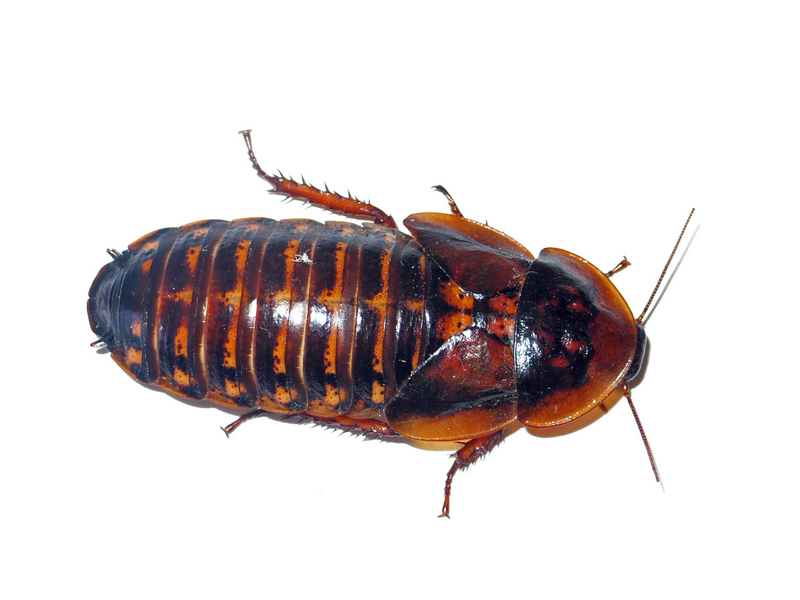 ~ by theboardedwindow on May 2, 2008.
i really enjoyed your description of the dubia roach, it was indepth and exactly what i needed to hear. ive had enough of crickets and locusts and im looking for a sustainable food source for my geckos and frogs, will dubias feed them all? even a frog as small as an asian bullfrog? feel free to e-mail me. one more question if you dont mind, can they bite? i can cope with being bitten by lizards and snakes and mammels but creepy crawly bites really freak me out lol. Really glad that I came upon your site. Very Informative, and a very professional layout. Do you know anywhere where I may be able to find nutritional information for comparison with other feeder invertebrates? This entry was posted on May 2, 2008 at 9:22 am and is filed under Blaptica dubia, Blattaria, Zoology.You can follow any responses to this entry through the RSS 2.0 feed.You can leave a response, or trackback from your own site.